Web maps are how users work with and apply ArcGIS, and can be used anywhere—in web browsers, on smartphones, and in desktop GIS applications. This web map asks a simple question: how many Americans live within a reasonable walking or driving distance to a supermarket or other sources of healthy food? Web maps are how you deploy your Web GIS. A web map is easy to share with others. You simply provide a hyperlink to the web map you wish to share and embed it on websites or launch it using a wide range of GIS apps. Anyone can make, share, and use web maps. Let’s start by going through a short example. Suppose you want to make a map that allows you to explore the food, architecture, and design destinations for San Diego. 1. 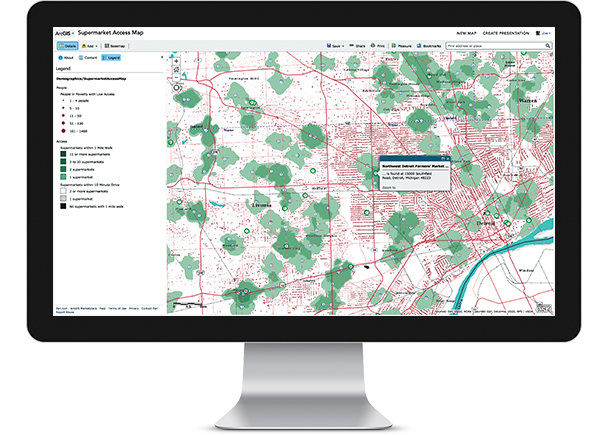 Select a basemap and zoom into your city of interest. We’ll use the Light Gray Canvas basemap. 2. Add your data layers and specify how each will be symbolized and displayed. In this case, we’ll add point layers for specific San Diego destinations, line layers for the trolley lines, and neighborhood polygons. It’s easy to share the map you make. Simply share the hyperlink, embed it in a website, or share the configured app. 3. Create pop-ups that enable users to explore the clicked-on features. 4. Save your map, then document it with an eye-catching thumbnail, a good description, and a thoughtful name. Every map, especially a map that you will share, needs a good item description, thumbnail, and name. 5. Share your map by using it to configure a whole range of apps. Once you create your map, you can configure an app that will use your web map for delivery to your audience.